Williams Interactive, a long time popular software developer in the online gambling market announced this week that they’ve relaunched one of their most popular online slots “Enchanted Fairy”. This news is being met with excitement amongst fans of this platform, it’ll surely rise to its former popularity once again. 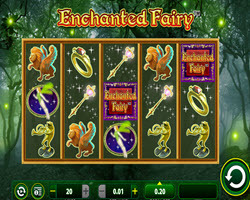 Enchanted Fairy for those whom don’t know, is designed as a 5 reel, 20 payline video slot. It portrays a mystical fairy theme that showcased magical lions, jewelry, wands, fairies, rings and more. The icons don’t compare to the stunning background which has a sepia tone to it, dozens of trees lead the way as firefly’s roam through their branches. While venturing this mystical forest a punter will be introduced to multipliers, free spins, scatters and wilds. This’ll provide big wins worth hundreds to thousands of dollars. This slot was previously available through the WMS Platform. Unfortunately, it was taken down early last year but has now been re-released. The re-release also includes new graphics, giving a modern essence to the game. This’ll also provide a more exciting experience for returning players to this title. The same payouts, betting options and theme await to be re-enjoyed once again though. Whomever wishes to play this title only needs to find a casino which supports the Williams Interactive gambling platform. This title as well as dozens of others shall be available as well. Registering for an account with a casino is easy as 1, 2, 3 and in return a gambling experience unlike any other awaits.